The Pacific War was a war of extremes. Though most of the decisive fighting took place in the steaming jungles of the south Pacific and southeast Asia, a significant campaign was fought in the arctic climate of the Aleutians and Alaska. 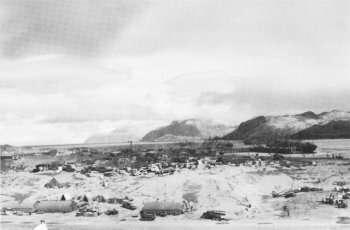 Airmen had to deal with freezing temperatures at high altitude at any latitude, and even troops in New Guinea found that temperatures sometimes plunged below freezing at night in the Owen Stanley Mountains. Arctic conditions posed unique challenges to military operations. Arctic soil is almost always saturated with water due to reduced evaporation, though this is obviously frozen much of the time and thus makes a stable surface. During the short summer months, the soil has the potential to turn into a sea of mud. Underlying most arctic soil is a layer of permafrost that hinders construction. Much of the terrain in the Aleutians was arctic bog. Construction in the Arctic required special measures to stabilize the soil and deal with permafrost. Travel in snow often required special equipment, such as the M29 Weasel, a tracked vehicle designed especially for use in snow that was the ancestor of modern snow tractors. Cold temperatures posed a threat to the well-being of troops. Insufficiently protected fingers, toes, or parts of the face could literally freeze, with consequent tissue destruction. In its mildest form, frostbite damaged the outer layer of skin much like a first-degree burn. More severe frostbite blistered the skin or froze the affected area solid. In the latter case, tissue destruction was complete and amputation was necessary to prevent gangrene. Hypothermia was a more general loss of body heat affecting the body core. This became a vicious cycle as production of body heat began to shut down, and it could kill its victim very quickly. Persons suffering from hypothermia also suffered from impaired judgment that reduced the likelihood of reaching safety in time. Hypothermia was responsible for most deaths at sea among sailors who abandoned ship with otherwise adequate lifeboats or flotation devices, and it could kill even at temperatures well above freezing. The U.S. Army sometimes underestimated the difficulties of arctic combat. At one point in the Attu campaign, casualties from frostbite outnumbered casualties from all other causes by two to one. It was eventually established that soldiers engaged in strenuous outdoor labor consumed as much as 700 calories per hour, and daily calorie requirements approached 5000 calories per day. The high calorie consumption was required to maintain body temperature and, in troops new to the Arctic, to fuel the body's natural acclimatization to cold of increasing the percentage of insulating fat. It follows that troops require a considerable period of acclimatization in addition to training and suitable equipment before they can perform well in Arctic conditions. Equipment suffered as much as men in the Arctic. Ordinary lubricants froze at subzero temperature and rendered machinery and weapons useless.Multi-viscosity oils would not be introduced until 1954, which left little alternative but to use the lowest viscosity oil possible , which increased mechanical wear due to marginally adequate lubrication once operating temperatures were reached. Even when low-viscosity lubricants were used, measures had to be taken to keep vital equipment as warm as practicable when not in immediate use. An adequate supply of fuel was thus essential to arctic operations. The difficulties of arctic operations were such that the Aleutians remained a secondary theater of war in spite of the fact that the islands lie almost along the great circle route from Japan to Puget Sound.